Aria GSM wireless phone offers communication facility using GSM SIM card on GSM mobile phones. The wireless phone also has caller ID function to inform you about caller’s identification and also records call history for future analysis. It also comes with great storage capacity that offers you to save up to 100 contact details in this device. 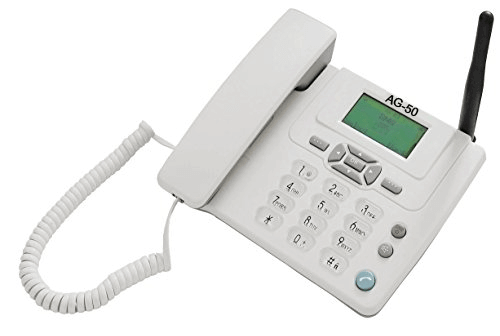 Its alphanumeric keypad and LCD display screen gives a clear view of call details. It also enables the redial facility that enables dialling the last received/diallednumber instantly. It also offers call resume and conference facility along with hands-free connectivity. It weights very light as 800 gm and easy interfaces. It is best alternative option to connect with remote areas and places like industries, exhibitions, offices and construction sites etc. The most obvious advantage of GSM is its widespread use throughout the world. GSM phone has a harmonized spectrum that offers smooth operations on different frequency bands. Users can communicate seamlessly between networks and through the same number. GSM Phone is better because it is used throughout the world and offers a greater variety of GSM phones that operate on GSM line. Thus, consumers get more flexibility tochoose a handset that fits their specific desires without any limitations. GSM phones share the same bandwidth and can handle large users without any interference. GSM wireless phones offers a seamless communication over same or different network that ease the whole communication process.